I’m going to finally get around to tackling that last category of pigments, the synthetic organics. There’s probably a reason for my tardiness: this is my least favorite group, and one that interests me very little these days. Recall that the three we’ve done before were: natural inorganic (these were the earths and natural minerals); natural organic (lake pigments, other pigments that come directly from plants and animals); and synthetic inorganic (the great chemistry accomplishments of the nineteenth and twentieth centuries, ultramarine blue, cadmium red, etc.). The story of the last category begins in the nineteenth century, but is mostly a twentieth century phenomenon. There are so few real natural organic pigments in use any longer – mostly just the various carbon blacks – that the word “synthetic” is generally dropped from the term “synthetic organic,” having no other category to make it necessary; and these colors are simply called “organic,” since they by and large are the only organic colors out there. The name is a bit misleading at first. Most of us tend to feel a bit fuzzy when we hear the word “organic” – after all, usually it means healthy; it means natural; it probably means eco-friendly, cage-free, free-range, no hormones or pesticides, etc. However, in this case “organic” simply means that the substance in question contains a carbon molecule, and the feedstock from whence it was created probably existed, once upon a time, in the form of actual organisms. I’m talking, of course, about hydrocarbons: petroleum, natural gas, coal, etc. These substances are industrially heated, pressured and combined in various ways, sometimes with industrial acids or other chemicals (my knowledge is very weak on details here), to create the synthetic organic substances. Hmm… my fuzzy feeling has suddenly gone away. From the Encyclopedia Brittanica: “Synthetic organic pigments are derived from coal tars and other petrochemicals.” By “coal tar” they mean the residue byproduct from burning hydrocarbons such as coal or natural gas. Some coal-tar colors began in the nineteenth century as dyes: mauve, alizarin crimson, the aniline colors – and some of these were laked to create the first synthetic organic pigments. (Some are insoluble to begin with, and don’t require laking.) The twentieth century embraced and expanded upon this line, notably with the azos, the phthalocyanines, the quinacridones, the perylenes, the anthraquinones, the pyrroles. These are consumer colors – bright and saturated, capable of being produced on a tremendous scale, and cheap. They are truly modern colors, not only in the history of their production, but also in their flash and chromatic glory. Without these colors, the commercial world around us would be much less colorful than it is. The benefits of these colors for artists are often cited. There is the very full range of color they make available to the artist, the ability to mix almost any color that could ever be needed by the average painter. They have provided excellent, durable replacements for older, less lightfast natural organic colors that have been weak spots in artists’ color wheels for centuries. They are inexpensive compared to some of the synthetic inorganic pigments, such as the cadmiums and cobalts. Finally, they are a less toxic alternative to those cadmiums and cobalts, and are increasingly turned to as the more toxic metals are falling under legislative ire. In an earlier post were introduced two varieties of pigments, the natural inorganics and the natural organics. 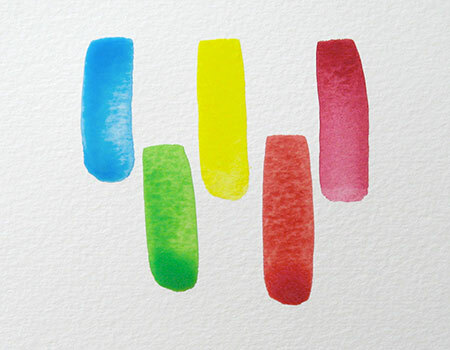 Third are the synthetic inorganic pigments. These are the human-made colored materials that contain no carbon atom, and are essentially artificial minerals and metals. In my opinion this group of pigments represents some of the greatest historical triumphs of colormen and alchemists through the ages. The earliest were Egyptian blue and Han blue and purple from China; then there is lead white and lead red; vermillion, verdigris, smalt, blue verditer, lead-tin yellow, cobalt blue, synthetic ultramarine, veridian, cadmium yellow, cadmium red, cerulean blue, and so on. Some of these colors have been discontinued from the artist’s palette because of their great toxicity. Naples yellow genuine and vermillion genuine are made by only a few manufacturers now; lead white is still available in art supply stores but is generally only used by professional artists with a flair for tradition. Other synthetic inorganics, such as manganese blue, have fallen out of use because of economic or environmental considerations. Still others, such as ultramarine, are safe and made easily from common materials, and will probably be in use for quite a long time to come. Ultramarine represents, for me, the greatest example of the triumph of the artificial synthesis of color. Not only in the fact that it is essentially chemically identical to the natural lapis lazuli (minus some impurities) – but it also took a breathtakingly expensive and difficult-to-obtain item and brought it within the reach of everyday artists. Processed lapis lazuli once traded its weight for gold – literally. Its use was identified in Europe first with the heavenly, and then with opulence. Now the synthetic variety can be bought in a tube for a few bucks. What was once one of the most expensive pigments you could buy (or more likely couldn’t buy) is now one of the cheapest. Despite my interest in natural pigments, I’m not overly interested in really expensive ones. I think art materials should be readily obtainable by artists, and the successful synthesis of ultramarine was a great step forward for the art world. The example at the top of the page is a drawing and simple underpainting done in ultramarine by myself, from life, a couple of days ago. I’m unused to working in this way – normally I like to do a drawing and/or underpainting in natural burnt umber. 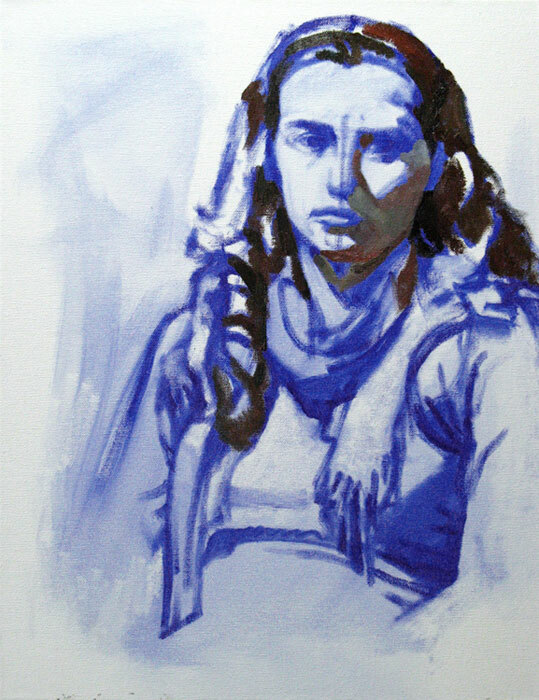 This approach using ultramarine is one recommended by my teacher in order to allow the coolness of the blue to affect the layers of shadow color painted above. (I of course screwed it up a little by “erasing” the drawing too often, bluing the entire canvas.) This unfinished painting is relevant to this post in that a material must be common and inexpensive to be used in this way. The natural ultramarine of centuries past would never have been thrown onto the canvas only to be mostly covered up by the subsequent layers of the painting. To do so would have been outrageously extravagant, like painting opaquely over a gold ground. Today it is easy. Not only did the advances in synthetic organic pigments over the past couple of centuries expand the artist’s palette – they made possible entirely new ways of approaching a painting that would have been unthinkable before. 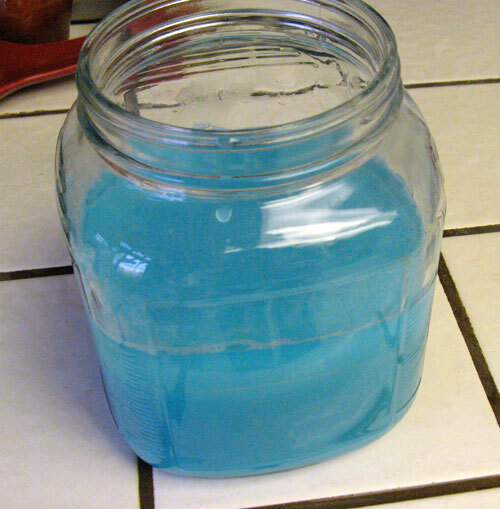 Smalt, a cobalt glass pigment, was indeed used in this way before the days of artificial ultramarine, but smalt does not have anywhere near the depth and saturation of ultramarine. Smalt needed to be darkened with burnt umber or another dark earth, which also would have desaturated the color and made for a quite different effect. In the painting above, the drawing was done with ultramarine alone. The synthetic inorganic pigments that I have some experience making are various copper blues and greens, and mars yellow from iron sulfate. I’ll post about some of those later on. Next week we’ll see how this little painting turns out. Virtually all of the various artist’s pigments can be grouped into one of four categories, although there are a few that are not quite so easy to nail down. I’ll go through the different kinds, with a word or two about the history of each; I’ll mention a few of the borderline pigments in a later post. The four pigment categories are: natural inorganics; natural organics; synthetic inorganics (sounds almost like a double negative, doesn’t it? ); and synthetic organics. First are the natural inorganic pigments. These were some of the first in earliest human use, dating back many thousands of years and found in the cave paintings and hieroglyphs around the world. They are natural pigments that do not come from any organic source, neither plants nor animals. They are the earths, rocks, minerals, and crystals. Of these, the earths are particularly attractive to me. These are the yellow and red ochres, the siennas, the umbers and green earths. They are plentiful and varied, subtly beautiful and workhorse-ready. They seem to be an offering from the earth itself: look; take these and make your own works of wonder. For me, no other pigments give a closer connection with the natural world than the earths do. Other, brighter minerals are lapis lazuli, azurite, malachite, cinnabar, orpiment, turquoise. Some of these, such as cinnabar and orpiment, are quite toxic. Next are the natural organic pigments. These are pigments derived from plants and animals. This is the category that holds the most fascination for me, the one with which I spend the most time. 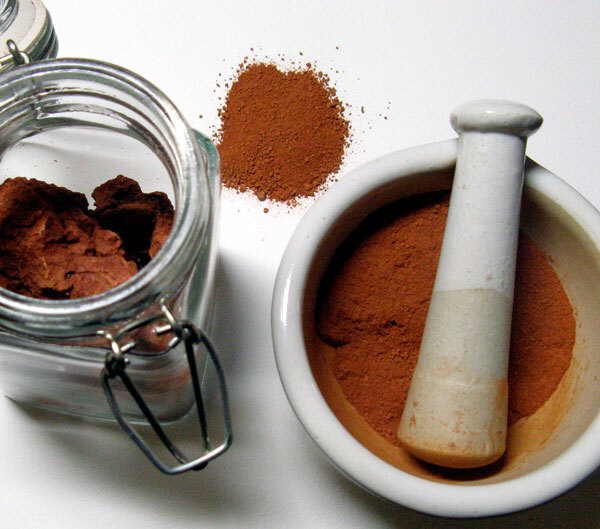 The largest group of natural organic pigments are the lake pigments, which are natural dyes combined with a neutral metallic salt base to form insoluble pigments. These are rose madder, stil de grain, weld lake, carmine, etc. Other natural organic pigments are indigo, gamboge, carthamine red, vine black and eggshell white. 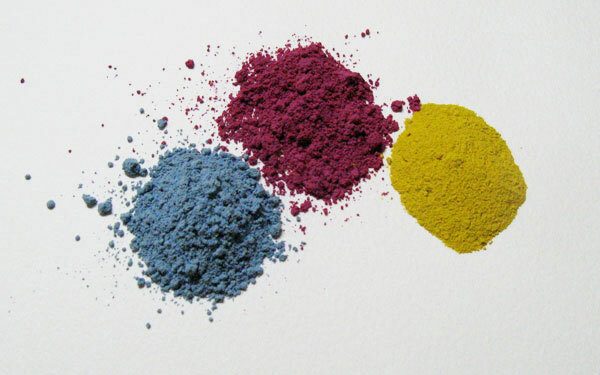 The three powdered pigments in the picture to the right are, left to right: natural indigo mixed with calcite; brazilwood lake; and weld lake. The natural organic pigments have given us some of the most beautiful and fascinating artist’s colors ever made. Most of them are also unfortunately impermanent to light – many of them drastically so, earning them the description “fugitive.” Even rose madder, which is far and away the most permanent natural organic lake pigment I know of, is today considered by many to be unacceptably impermanent for fine art work – though it was considered permanent by many in the past. The natural organic and inorganic pigments are the categories I’ll be focusing on the most throughout this record, so it’s not necessary to write more about them just now – there will be plenty later. I’ll continue with the third and fourth categories in my next post. Happy holidays everyone!